On our way to our summer holiday destination, we spent a night in Red Hill, Brisbane. My sister-in-law who we were staying with put me onto a bike track that follows the Enoggara Creek in Red Hill. 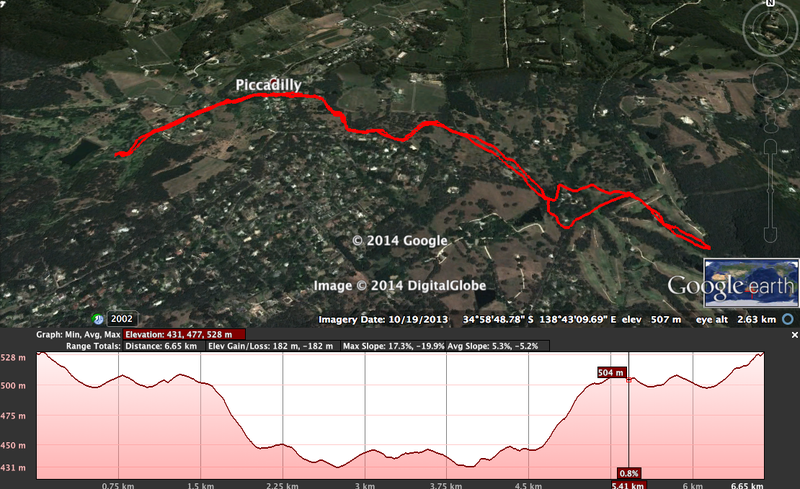 Here’s my route, just under 6km return. Usually when I’m in Brisbane, I’m closer to the CBD so usually do runs along the Brisbane River, so it was a nice change to run through the suburbs and see some different sights. 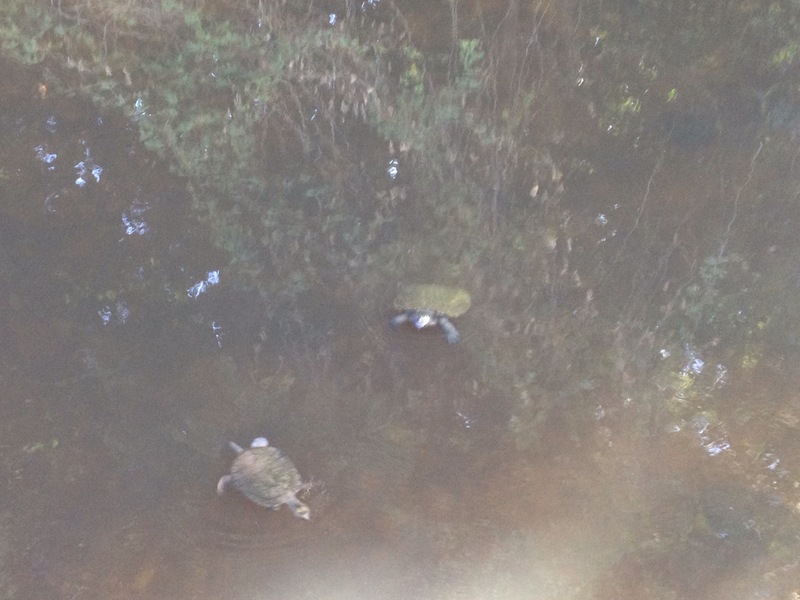 There were turtles in the creek and plenty of blue quandong trees (something we don’t see in my home town of Adelaide). The humidity was intense, I think I broke into an immediate sweat as soon as I stepped outside (at 6am). Although I sweated a swimming pool full, I still felt great on the run. I’d like to run a longer length of the track when I’m next in Brisbane. So in a terrifying, death defying dance floor accident, I’ve broken my toe. On the day before I was planning to run a half marathon. Well that might be a slight exaggeration. I was on the dance floor, when somebody trod on my foot in a very high heel. And I think I have a broken toe. Actually, I would put money on it. Today was supposed to be the culmination of 16 weeks training to run a half marathon distance. Due to my work schedule, I haven’t been able to participate in any organised half marathons this year, so I had planned to go it alone. My planning had been meticulous. I planned a course (hilly because I can’t get enough hills), made my favourite energy bars, and packed my favourite running gear. As we were at a wedding the night before, and staying over, I had planned it to the letter. I didn’t drink (well maybe a little), had a LOT of water, and ate really well. What I didn’t foresee was the hazards of the dance floor. Although being trod on hurt like hell at the time, I thought, ‘I’ll be okay in the morning, no worries.’ So this morning I laced up my shoes to discover that standing was fine, walking was not. In fact it was very, very painful. No running for me then. I got cross, I got frustrated, I got annoyed at myself for not being more careful. What did that achieve? Nothing. Then I got upset that I might not be able to run at all until it heals. What did that achieve? Nothing. After wallowing in my own self-pity for a few hours, I realised that i just needed to get on with things. I started to think about other ways to keep my fitness up while off running, and research how to get back into it. My first decision was to dust off my bike. I don’t think I’ve ridden it for a few years, so I’ll need to check the tyres and give it a service. That will keep my general fitness up hopefully. In terms of running, I headed home and immediately chose two events to do , one 5km in December to get back into the swing of things slowly, and a half marathon in April. I’m hoping having some concrete goals will allow me to give it the time it needs to recover, while still staying focused. I’m terrified of losing the will to run. Running has gotten me through some tough times and until now I’ve been injury free. It has taught me so much about myself. I can’t imagine life without it. But like those gruelling long runs have taught me, all you can do is push through, do what needs to be done and get back into it when I can. Just like Ginger Rogers and Fred Astaire sang, ‘dust yourself off, pick yourself up and start all over again‘. 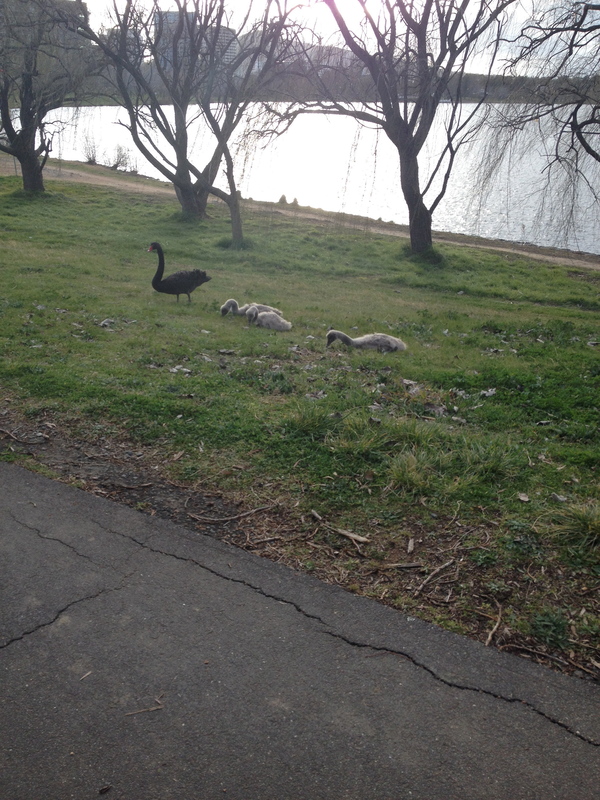 I had one more chance to go for a run while working in Canberra. I needed to work a 14 hour day on my feet, so I figured an easy run was in order. I headed along the edge of the lake, stopping to have a look at a statue of Australia’s longest serving Prime Minister, Sir Robert Menzies on the way. The lake is very beautiful, and cannot be captured in pictures. I did stop to take one picture however, as I could see Black Mountain in the background (I had run up this earlier in the week, see Running in Canberra Part 2). I would have loved to have more time to explore the lake so will have to do so on another visit. I then turned up Anzac Parade, where various memorials line the path up to the Australian War Memorial. On Anzac Parade, my run got a little emotional. Passing the Air Force memorial, and the Navy memorial, then the Royal Nurses memorial, I got to thinking about my grandparents who served in, or after World War II. I only briefly spoke to each of them about it before they died, and for the rest of my run, I felt like they were running alongside me, pushing me onwards. This was a very timely reminder for me. To be thinking about their struggles, and the suffering they would have witnessed, while I was running made me realise that the challenges I have in my life, and the suffering I feel when running a long run are minimal compared to that created by war. As my husband would say, it’s all relative. And sometimes remembering that can help push through the struggles and suffering onto things you never imagined possible. One of the prominent features of Canberra is the few mountains that surround the centre of the city. From the window of my accommodation, I had been longingly looking at Black Mountain as a potential running spot, so when I got my first chance, that’s where I headed. Black Mountain sticks out like a sore thumb, mostly because a fairly ugly phone tower has been built on top of it. Personally, I feel it is a bit of a pity to spoil the top of a mountain with something that is so aesthetically unappealing, but thankfully that doesn’t affect how much one can enjoy running up it. Being so visible from anywhere in Canberra, I decided not to check a map, and just run towards the mountain until I found a trail. Doing so meant that I had a little detour until I found a track but there was success at last. It was a great run. 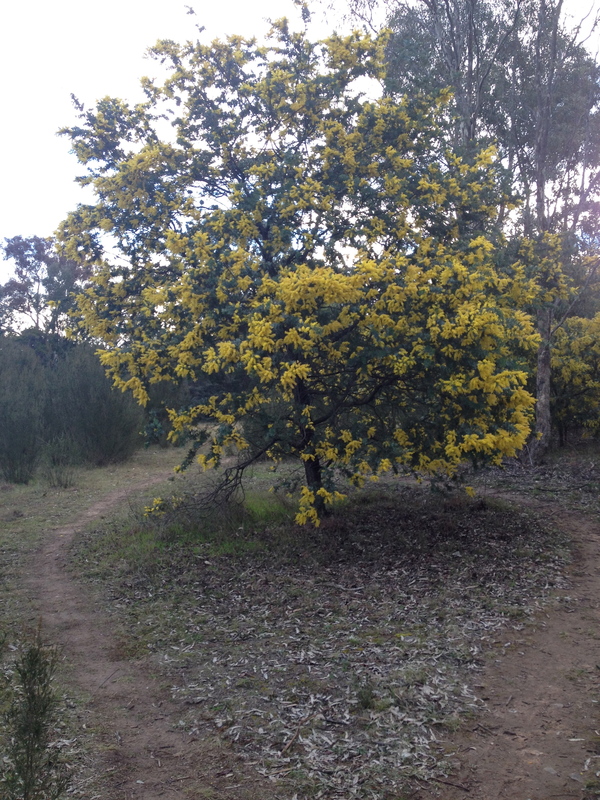 I came across the most spectacular wattle trees in full bloom. The first trail I found looked promising, until I realised that the Botanic Gardens were closed, and I would have to run around the fence until I found another way up the mountain. Eventually I came across the Canberra Centenary Trail which led up the mountain. While on this trail, I came across a summit walk which I then followed to the top. I was under time restrictions because I had to go to work not long after this run. I was about 1km from the top, when I really should have turned around so I’d have enough time for a shower when I got back to my hotel room. But that close to the top, there was no way I was turning around. I got to the top and quickly took a happy snap to prove I was there, then had to speed to the bottom of the mountain to get back in time. I had to stop halfway down, to get a picture of the beautiful evening sun coming through the trees, then I was in a major rush to get to work. 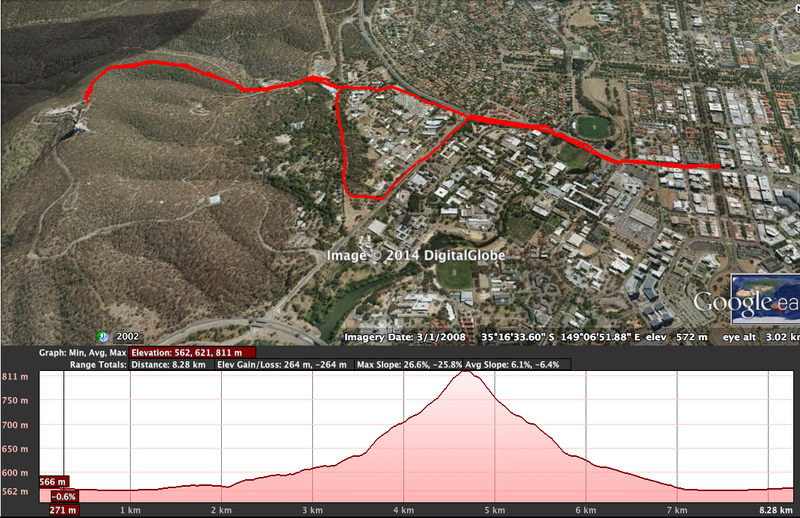 This was a really fantastic run that I would recommend to anyone who likes a hill or a trail. Try it out next time you are in Canberra. So one of the best things about running for me, is that I get to explore new places. This week I’m in Canberra (Australia’s Capital City) for work, and there’s no better way to see the city than running. I knew I’d have time constraints with my work commitments and running is a great way to see the sights in a brief space of time. Canberra is a runner’s paradise. There are a lot of flat areas, but if you feel like tackling a trail, there’s plenty of nature parks within a few kms of the city centre. 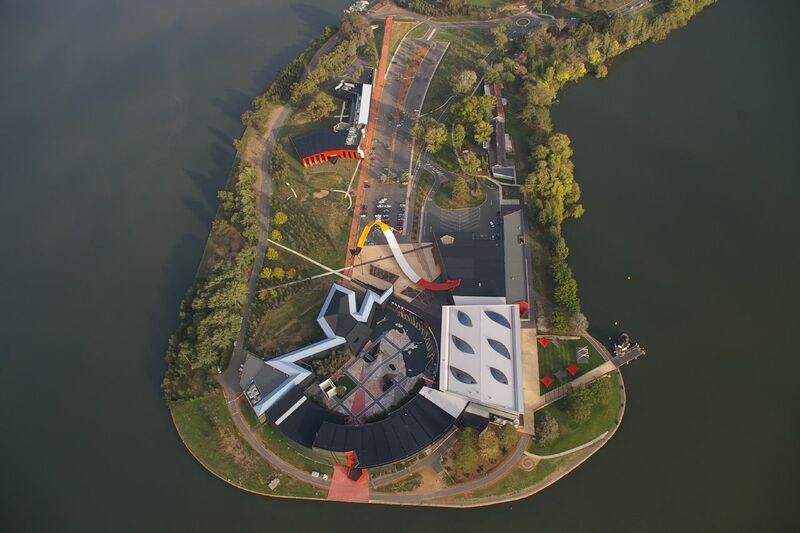 I’m planning 3 runs here in Canberra (or 4 if I can get up early enough before my plane leaves! ), so for my first run, I thought I should see some sights. This was my favourite type of run. One where you set out in a general direction of something you want to see, but one where you allow yourself to get completely off course and end up seeing something else amazing. I had decided to head in the direction of Parliament house and Lake Burley Griffin. Many friends had told me they enjoyed great runs around the lake, so I thought it might be a good place to start. 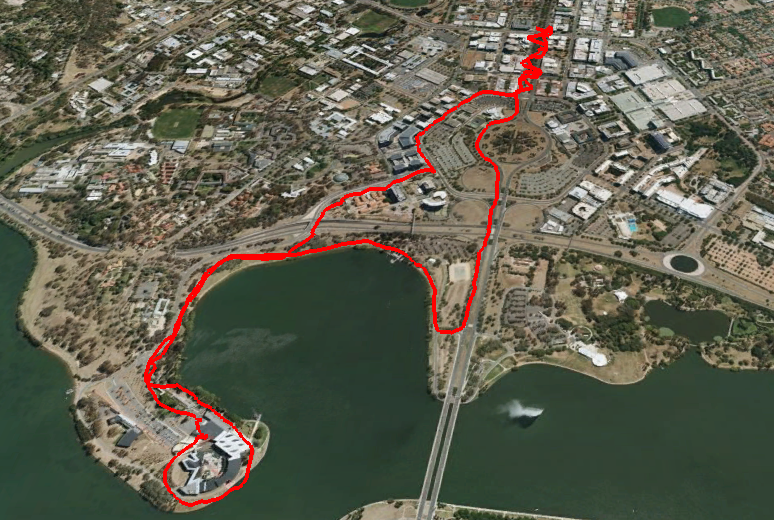 Lake Burley Griffin is made up of three basins and apparently it is quite popular to choose one of the basins for a circuit run. The central basin (between the two bridges) is the most popular, being around 5km. I knew I didn’t have time to do a whole basin run, so instead I just headed along the lake. Soon I came to the National Museum of Australia which is an amazing piece of architecture that has to be seen to be believed. Designed by Howard Raggatt, it is so multi-faceted that running around it was incredible. Every time you turned a corner, something new and interesting was revealed. Most interesting to me was the braille that adorns the exterior walls. I had to look it up when I came home to find out what it says. According to Wikipedia, the braille translates to some common Australian sayings, such as ‘She’ll Be Right’, but also includes more controversial sayings relating to the white occupation of Australia. The controversial phrases have since been obscured by metal discs placed on top, making them illegible. By the time I had marvelled at the museum, I realised I was 2km further than I really had time for, so had to high-tail it back to my room to get ready for work. It still wasn’t all business, I managed to stop and watch some lignets on the way back. All up, a nice 7km run to start my week in Canberra. 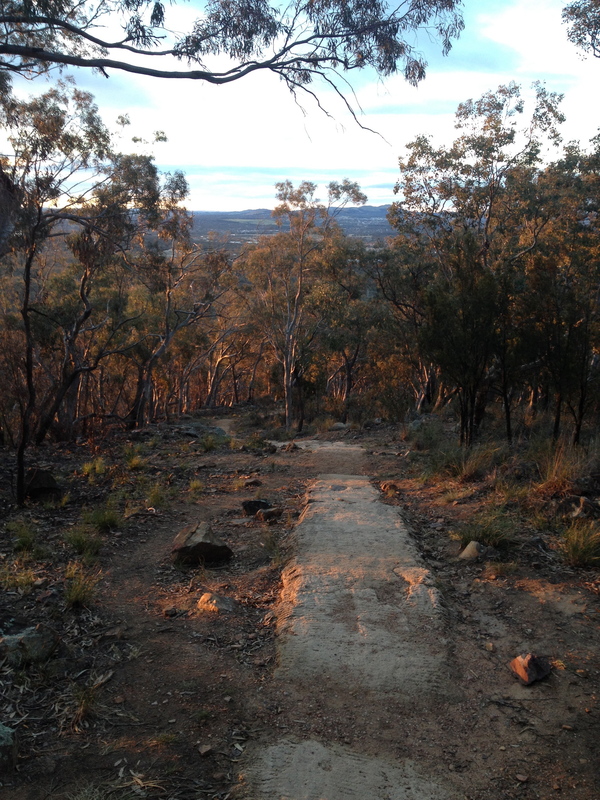 Stay tuned for my next Canberra run, which I’m hoping will be a trail run in one of the nature parks. 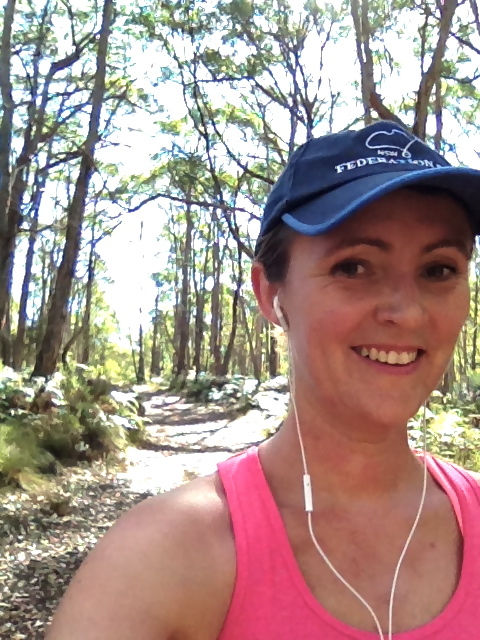 My latest Heysen Trail run was 6.4km return from the Mount Lofty Botanic Gardens through Woodhouse to the Mount Lofty Golf Course. For those who don’t know, Woodhouse is an activity centre with plenty of outdoor activities, including Challenge Hill which is a large-scale obstacle course. There are various facilities and groups can either camp, use dorm-style accommodation or come just for the day. Woodhouse is used by organisations, schools and individuals as a fun outdoor activity. Running on the Heysen Trail through Woodhouse, I was followed by a group of Rosellas and Willie Wagtails who darted in and out of the trees in front of me. I came across a group of young school children who were delighting in being outdoors, regardless of the wind, rain and cold weather. It was great to hear them laughing and running around, being active in the middle of winter. It is exactly what kids need. It reminded me that I need to bring my kids to Woodhouse sometime in the near future, a great place to get kids active and enjoying the outdoors, no matter the weather. And I’d really like to test myself on Challenge Hill! 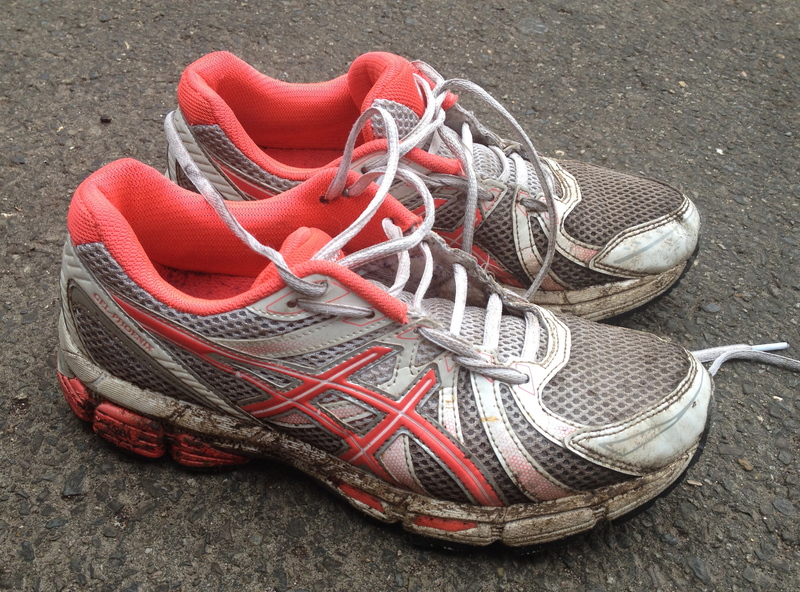 It was a muddy run, and my shoes were testament to the fun I had. I had to make a decision a few months back. I was trying to finish my Masters thesis while caring for my young family and working 45 hours a week. Something had to give. I decided it had to be my obsession with running. My love of running is too deep, I thought. As soon as my thesis is finished, I’ll just pick it up again. Easy. I did it once, I can do it again. I’m not saying I stopped running altogether. I was still managing to get out once or twice per week most of the time. But my distances decreased. Before I was running around 25 – 30 km per week. I dropped down to between 5 -10. Well, I got my thesis finished. All handed in and now all I have to do is wait to see if I passed. So, it was time to reignite my passion for running. It seemed like a good way to ease back in. I was doing really well until I hit Thursday. 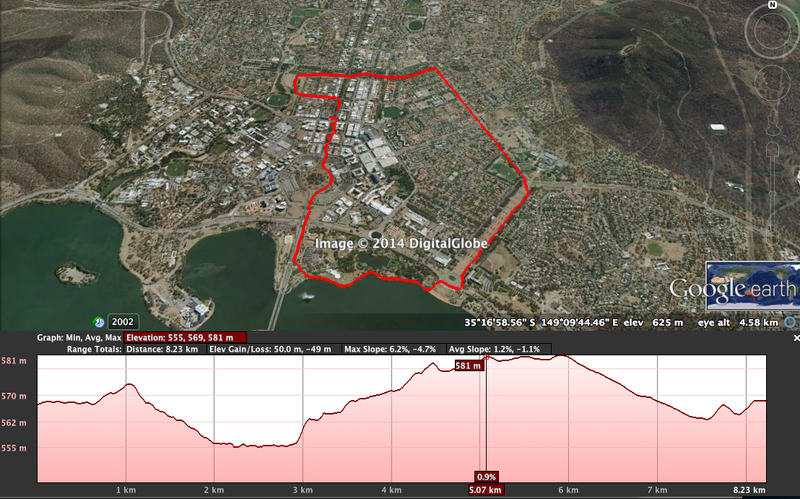 I decided that I had been feeling good so tackled a 5km hilly run instead of the 4km. 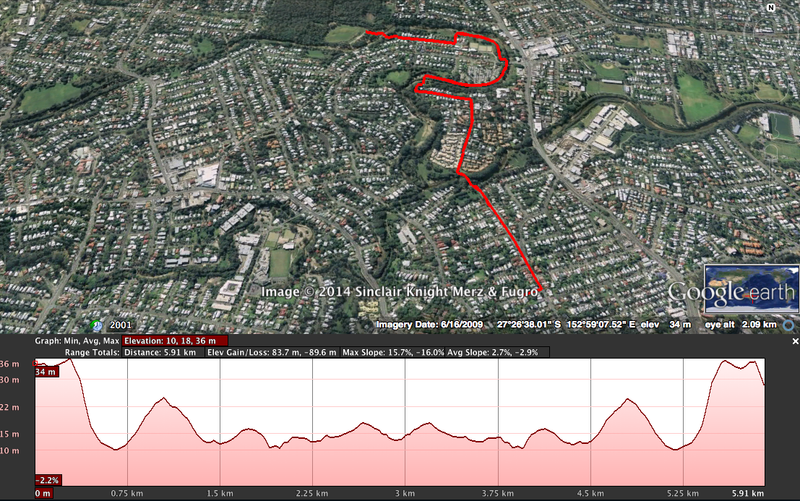 But with the DOMs I had from the previous two strength sessions, I was struggling at the first hill. I thought ‘it’s all about mental toughness, I can do this!’ and kept going. At the third kilometre, I bonked. I had nothing left. But I had to get home. So I walked for the next kilometre. I managed to run the fourth and walked the fifth. I was exhausted. I started to think, maybe I can’t do this. Do I have to learn to run again? Surely I can’t lose that much fitness in two months? Thankfully the next two days were planned rest days. I regrouped, and decided that I’d just work on getting my frequency back up and not worry too much about how far or how fast I was running. Sunday’s run was good. I took my dog, who is old and arthritic, so he kept my pace slow. Today is the Tuesday of week 2. I went for a 4km run this morning, and for the first time in a while I got home feeling like I could have gone further. Game on! I’ll try a 5km on Friday and then I might be back on track. I was hoping to start a half marathon training program next week so we’ll see how I go. The important thing to remember is to go easy on myself. And enjoy the run. Today’s run was supposed to be 14km, but I decided to take a detour from where I had planned to run, and hit a trail near my house. There’s a bush park about 4 km from my house, that I’d taken the dog to before, but having only done the walk up to the lookout and never having ventured further, I thought wasn’t all that good for running. Today I planned to run past the park onto a road I had never run before, to do some exploring, however as I set out for my run today, I realised that I had pulled the sunscreen out of the cupboard, but had forgotten to put it on. I decided that I’d need to find the shadiest run I could to avoid burning to a crisp, and the bush park provided the perfect opportunity. My expectations were blown out of the water and it turned out to be the best run I’ve had since the Summit to Sea. 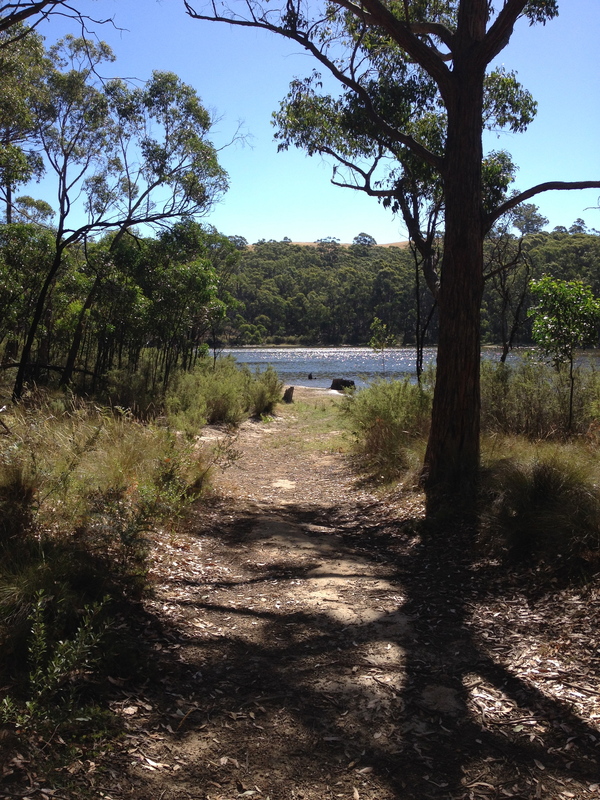 A secluded lake (that I plan to bring my kids to on our next family hike), and a canopy of beautiful Grey Box Eucalypts and an understory of bracken provided the scenery, plus it was just challenging enough to keep me in the moment. I think the smile on my face in this shot says it all. Unfortunately my pace was terrible, as I kept stopping to admire the view, and because I stopped so much, I only had time for 10.5kms instead of my planned 14km. I think I’ve found my new favourite place to explore on my long Sunday runs! So it’s going to be over 40 degrees Celsius (104 Fahrenheit) here tomorrow morning so I’ve planned an early morning run (8km) and have been taking in extra water tonight to stay hydrated. I’m not sure if my big, black 10 year old dog will cope so I’ll have to convince him to stay home (it won’t be easy, he’s been pacing between me and my running shoes all afternoon).